A versatile, flawless-sounding collection. A thing of beauty. Excellent samples. Captures the essence of the instruments well. Loads of tweaks on offer. 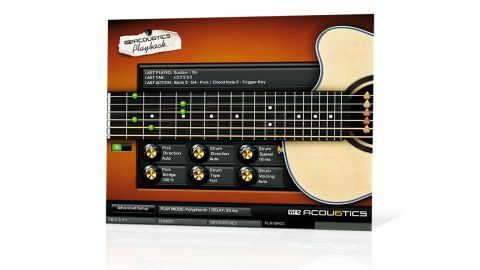 The long-awaited follow-up to Vir2's Electri6ity packs six acoustic guitars into an 11GB compressed Kontakt library. The guitars are steel-string (plectrum and finger), 12-string, mandolin, guitarlele (plectrum), nylon- string and ukulele (finger). "The amount of tweakability and performance/behaviour editing on offer is staggering"
Each one boasts at least 12 articulations (hammer-on, pull-off, sustains, numerous slides and releases, etc), every one accessible by all strings on all frets. Chords are automatically detected and converted into up to 50 selectable voicings on the fly, and custom voicing libraries can be saved and recalled. The amount of tweakability and performance/behaviour editing on offer is staggering, although the consequential onslaught of samey-looking menus can feel a bit overwhelming at times. As Electri6ity users would expect, the sound is pretty much flawless. Bone dry raw samples (recorded via Blumlein pair and piezo mic) capture the essence of the Acou6tics' six guitars to a T, ripe for processing via the onboard effects.